From the surprisingly short ingredients list, you can see that there are some ingredients that would be pretty typical for eyeliner and other long-wearing makeup products. There are silicones (Cyclopentasiloxane, Trimethylsiloxysilicate, Methicone, Dimethicone) which in this product function to improve the product spreadability and also as a film-former, as Trimethylsiloxysilicate is insoluble in water and forms a nice waterproof film when applied to the skin. Then there is Isododecane, which in this case functions as a solvent (probably for the Trimethylsiloxysilicate and other ingredients), and also helps in improving a product's wear and matte finish, as well as a variety of thickeners and film-formers (Polyethylene, Polyisobutene), waxes (Synthetic Wax, Ceresin), which you would expect in a makeup pencil-type product, emulsifiers (Polyglyceryl-2 Triisostearate), and pigments (Mica, Iron Oxides, Titanium Dioxide). From the ingredients list, you can see that the product is formulated to be waterproof and fairly long-lasting, with water-insoluble film-formers, and also to have a good glide, with a variety of emollient waxes. Strangely enough, there aren't any preservatives in this product (either that, or the Sephora ingredients list isn't accurate), although it could be because the product doesn't contain any water, and technically is an oil-based product. But if that's a concern, then I'd advise you to just use up the pencils and don't hold on to them for too long. 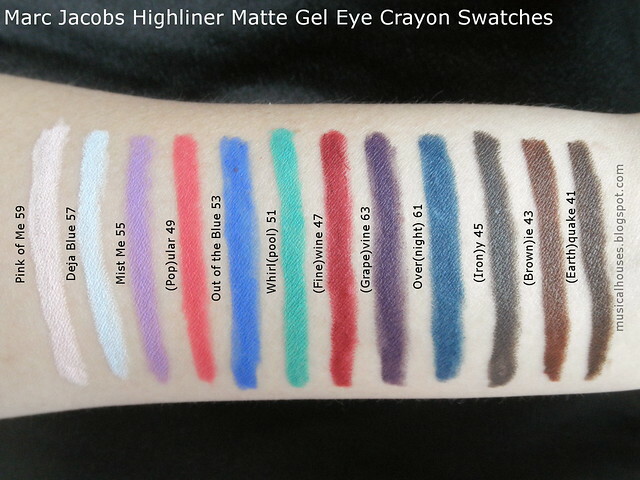 So, now that we've taken a look at the Matte Highliner ingredients, let's look at the swatches! 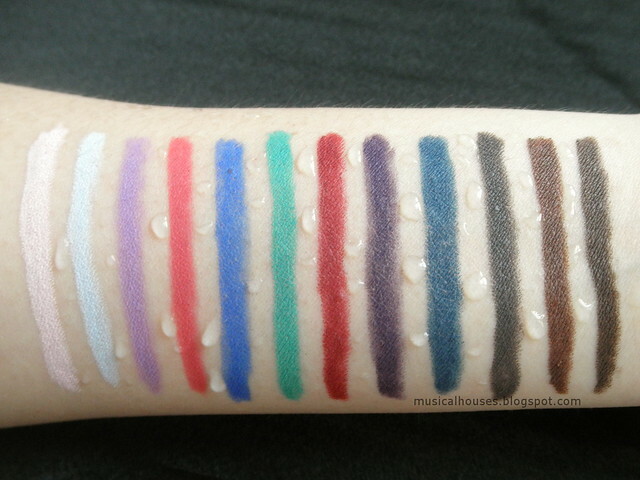 There are 12 shades in all, each with good colour payoff, and they're swatched above. Pink of Me 59 is described as a "Powder Pink", and I pretty much agree with the description. This is a pale pastel pink. Deja Blue 57 is a "Powder Blue", and basically the blue version of Pink of Me. Mist Me 55 is described as a "Lilac", and this is a very pretty shade that I imagine would make a great eyeshadow colour, if smudged out. (Pop)ular 49 is described as "Hot Pink", although to my eye this is more of a coral shade, and not quite intense enough to be "hot". Out of the Blue 53 is described as "Cobalt", and this is a lighter shade of cobalt to my eye - not quite as intense as I expected. Whirl(pool) 51 is a "Teal", and to me, this is more of a lighter shade of teal, a little bit closer to seafoam green. (Fine)wine 47 is a "Suede Red", and this is pretty much spot on - it's a lighter shade of red than the burgundy you might expect a wine shade to be. (Grape)vine 63 is a "Dark Purple", and I agree with this - it's a nice wearable eggplant shade. I love a deep purple eyeliner myself, so I can see this entering my daily rotation! Over(night) 61 is described as a "Deep Blue", but I feel like that description doesn't quite do the shade justice. This isn't a standard deep blue - it's got a bit of navy and teal mixed in, and looks pretty unique compared to your standard dark blue eyeliner. (Iron)y 45 is called a "Dark Gray", and that's spot on - this is a gunmetal grey that is a great softer alternative to black if you find straight-up black too harsh for daily use. (Brown)ie 43 is described as a "Medium Brown", and this is a nice wearable universal chocolate brown that I imagine is going to be pretty popular. (Earth)quake 41 is a "Dark Brown", and again I think this doesn't capture the nuance of this shade. It's brown, sure, but it also has some grey thrown in, so this is a lovely dark cool-toned brown-grey shade that is browner than (Iron)y, but still distinct from black. I also really love this shade, and can see it being popular as an alternative to a simple black. 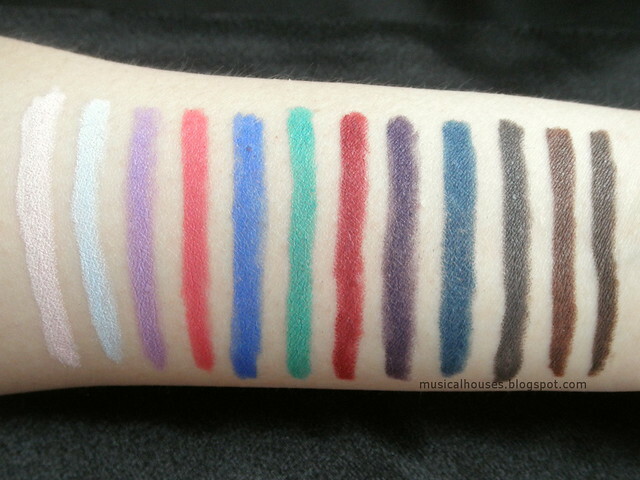 I love the pigmentation of the Matte Highliners, and I can see these being also used as eyeshadows because they are pretty blendable. In particular the lighter shades would be pretty nifty as eyeshadow pencils in a pinch, although they might be a bit too skinny to be comfortably used as eyeshadows regularly. 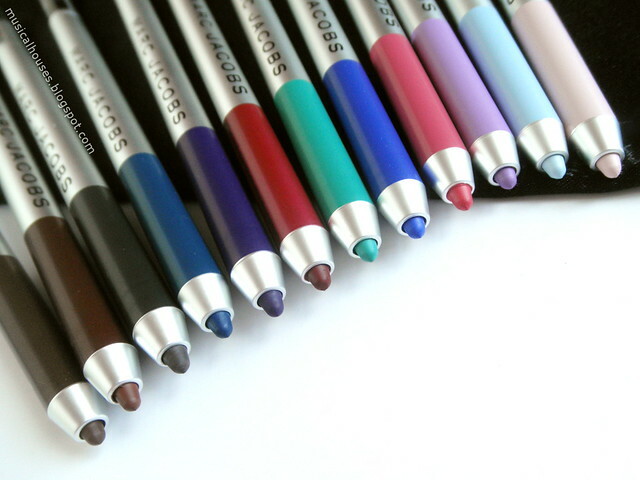 The finish of the Highliners is indeed matte, and you can see from the above photo (at an angle) that there is zero shimmer or glitter in the pencils. I also have to say, these are really smooth and emollient going onto the skin, and don't tug at the skin at all. Now that we've seen all the shades, let's put these eyeliners to the test! 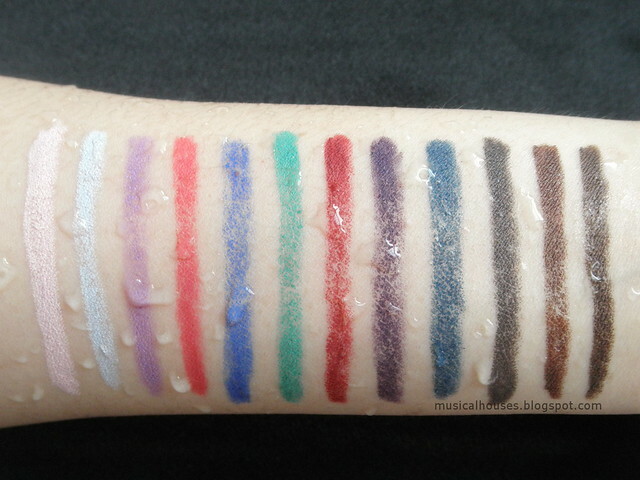 I've put the eyeliners through 3 different tests - a "rub test", where I let the swatches "set" and then try to rub out the swatches, a "water test", where I run the swatches under a tap to check if they're waterproof, and a "rub + water test", where I rub the swatches while they are being run under a tap. Typically, a good eyeliner passes the first two tests, but usually the "rub + water" test is trickier, and not all the eyeliners I've tested have passed the test. So if something stays on after the last test, it's usually great! So, let's start with the "rub test". I'm not sure if you can tell from the photo above, but there is the slightest fading with the rub test. The swatches are pretty much intact, and there is no smudging, so this is great - the Matte Highliners have officially passed the first test! If you don't have particularly oily eyelids, then touching or rubbing your eyes isn't likely to shift your eyeliner once it has set. Finally, the much harder-to-pass "rub + water test". 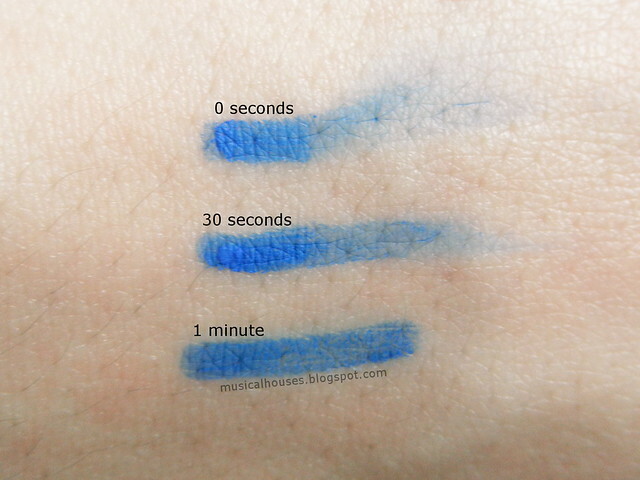 This one you can see the swatches started breaking up and fading a bit, but there was very little smudging, and the swatches are mostly intact - and I did rub hard for this test because I wanted to see how much they budged! I've had other eyeliner swatches completely disappear after this test, so although the swatches didn't hold up totally, I'd say these are actually pretty good - I'd happily wear them with no complaints whatsoever, especially given that these are pencil eyeliners, which tend to not hold up to this sort of tests as well as say, gel or liquid eyeliners. Lastly, I wanted to test out the "setting time" for the Matte Highliners. I noticed the formula was pretty emollient, and they do glide on very nicely, so I was curious about how long it would really take the eyeliners to "set" and dry down. Marc Jacobs claims that you need 15 seconds (and in the meantime you can smudge out and customize the line you draw), so I decided to smudge the eyeliners after some waiting to see how long they needed to set. I tested the set time at 0 seconds (so I basically drew the line and then smudged it immediately with no wait time), 30 seconds, and 1 minute, and I found that even at 30 seconds, the eyeliner still smudged. I found that I did need to leave the eyeliner for about a minute or so before it was budgeproof. I guess this is good news if you're going to use these as eyeshadows, or if you're going to do fancy things to your eyeliner, then the 1 minute wait time will give you a lot of time to play around with it. On the other hand, if you're in a rush, then waiting that 1 minute can seem like a lot if your eye is itching right that second! For me I'm pretty alright with the wait time, and it didn't matter that much to me - I just had to make sure my eyes didn't water and I didn't touch my eyes for a bit after application. 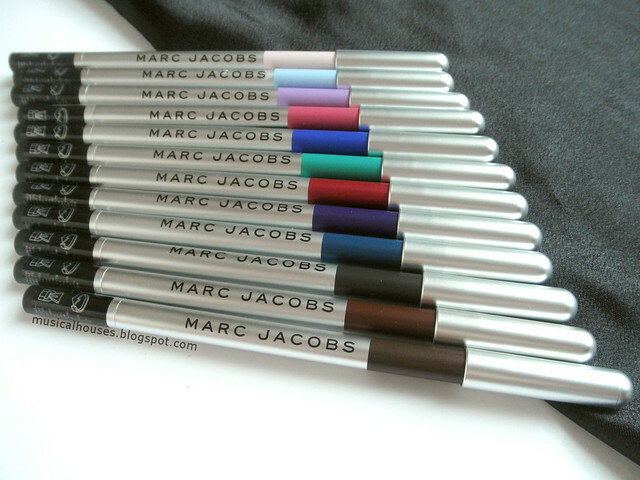 So, after that long review, would I recommend the Marc Jacobs Highliner Matte Gel Eye Crayons? I think I would! They're a bit pricey for sure at S$38 apiece, but the colour range, the lovely texture and glide that doesn't tug on the skin, the waterproof properties, as well as the lasting power make this a good choice. The only downside is that you do have to be patient and wait that minute for the eyeliner to "set", so if you are particularly in a rush it could be a bit of a hassle. But otherwise, I have very little complaints about the Matte Highliners, and would recommend them. 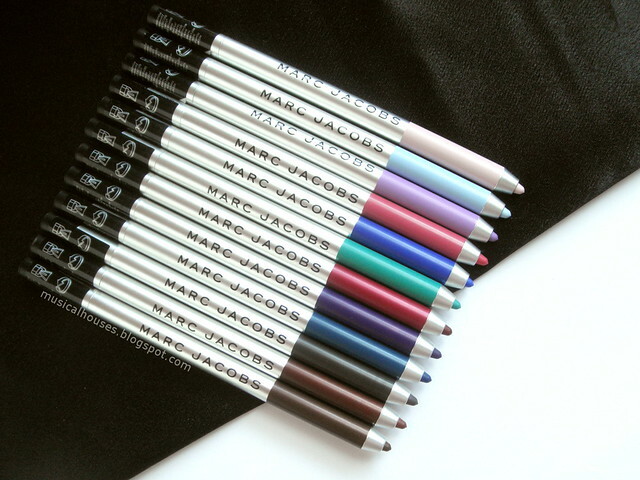 The Bottom Line: Despite needing some time to "set", the Marc Jacobs Matte Highliners are a good quality eyeliner, with a nice emollient glide, and are waterproof and long-lasting. 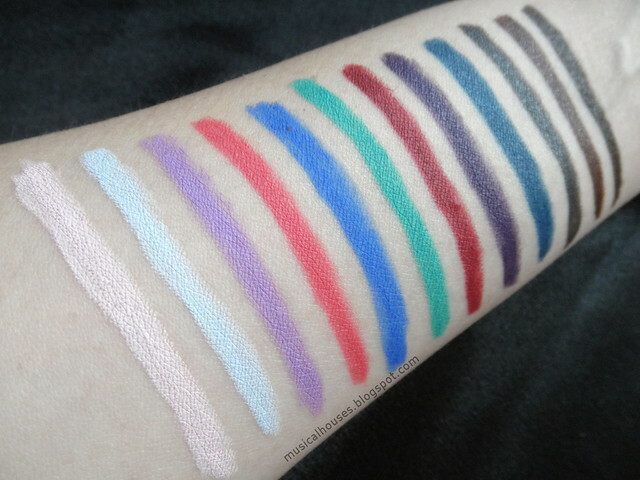 I really like the look of these, I just love a coloured liner. Plus the packaging is so 60s...very Barbarella-esque.